Masters of the mysterious and occasional caberet performers. This magical duo are going to be the Kairic Adepts in my vintage Silver Tower project – where I replace all the 2016 boardgame pieces with Citadel Miniatures from about 20 years previous. Like the Brimstone Horrors I painted previously, 1990s era Warhammer didn’t have Kairic Adepts, but did have Egyptian-flavoured magic users in the form of Light Wizards. And the 1990s Light Wizards also had Acolytes, which are perfect for Silver Tower Kairic Acolytes. These Light Wizards turned traitor from the College of Light alongside their Patriarch – Egrimm van Horstmann. 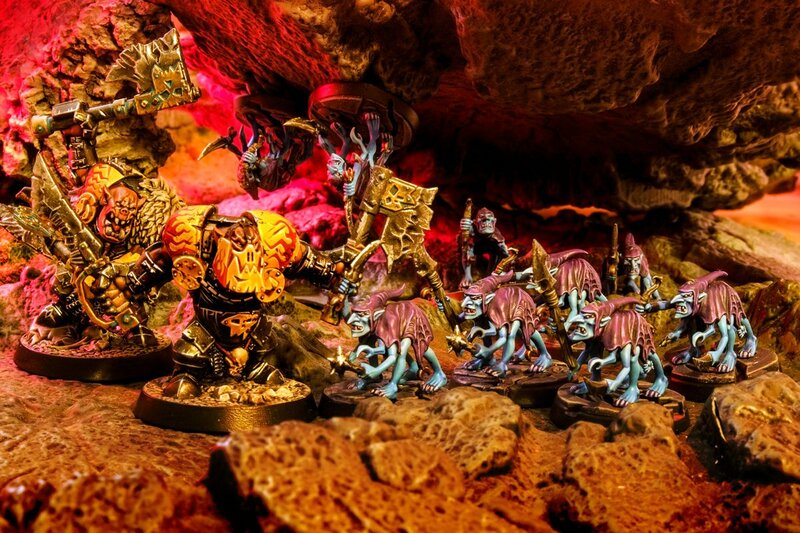 They have found sanctuary from the Empire in a Silver Tower of Tzeentch in my personal Warhammer canon. Egrimm himself will be big boss of the Silver Tower, as he was Tzeentch’s favoured servant in the 20 years before Gaunt Summoners were invented. Lapis & Lazuli supported by Blue Horrors in their Silver Tower. Games Workshop originally released the plastic Light Wizard (on the right in the photos) as the High Priest in the 1994 Talisman expansion Dungeon of Doom. He later appeared as one of the eight free wizard miniatures on 1995’s White Dwarf 186. 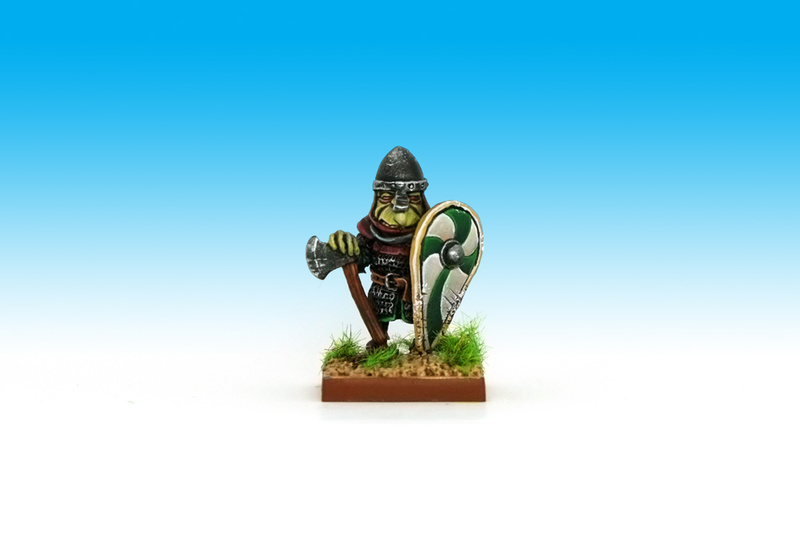 Getting a Warhammer character miniature in plastic was an insane novelty in the 1990s, as plastic was normally reserved only for the massed ranks of mono-posed regiments. Here’s Lazuli with the other classic 3rd edition Talisman miniatures I’ve painted to date. Lazuli and Pazyryk Banefire in the ruins of a non-metallic tower. Coming soon on Ninjabread: more vintage lead miniatures to populate my time-warped Silver Tower. I remember painting the plastic one so I’m really impressed by what you did with him especially ! That’s a Silver Tower I want to play right here ! And so you shall! When I have all the baddies painted we should do a group challenge to each convert a retro-adventurer. I fancy taking the classic Blood Angel Captain miniature and making him into a 1990s Stormcast. Then we all meet up to play and drink and high-five. Those robes are amazing, so much contrast whole still looking clean and white! Thanks! I experimented with painting some texture onto them too – feathering the highlights. Hope I can sustain it for all the Acolytes. Cheers Grove! Planning on eventually doing the metal version mounted on the plastic horse to complete the Triumverate! I am really enjoying this project. These two guys are so… opulent. You’ve shone these lads to such a sheen I can smell the perfume. 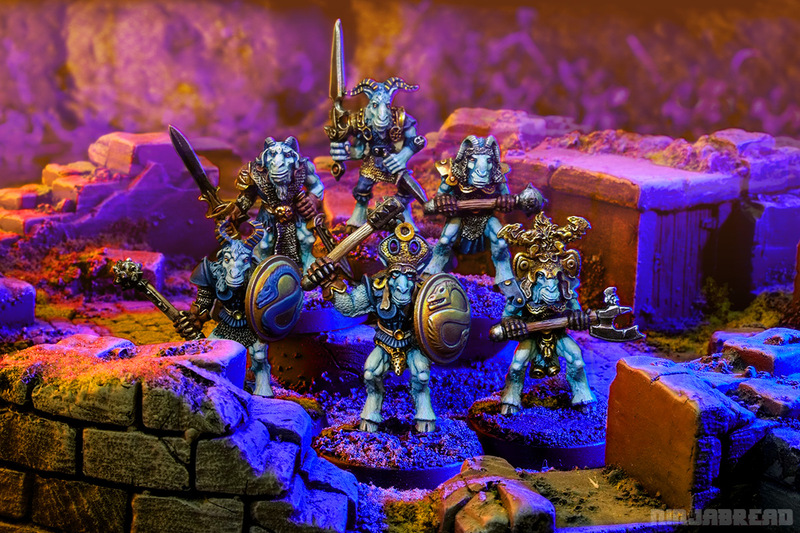 I’m so looking forward to playing Silver Tower with these minis on the board, but I have a sudden urge to source a vintage hero worthy to tread in such a dungeon. Do it! Do it! I’m halfway through retrofying the dungeon monsters, and when I’m complete I want a series of games where all the heroes are classic 1990s lead too. Ooooh! They look gorgeous, what a work on the robes! Beautifully painted. I like the idea of using these figures in Silver Tower. I’m also pleased with myself that I guessed correctly which one was plastic. Hurrah! One Ninetieshammer point to you. Doing the reverse of this project appeals to – taking the mid-1990s Warhammer Quest and replacing all the plastics with modern equivalents. Lovely work. In fact it’s a case of the paintwork on both of these two massively exceeds what the particular figure sculpts “deserve”. Probably the best paint job that these two models have ever gotten. Yowzer! Superb work, as always mate! Oldhammer FTW!